Welcome to winter in Maine! Over the past couple of weeks Mother Nature has blanketed the state in A LOT of fluffy white stuff. As school vacation week begins in the coming days, there is an abundance of winter activity choices for adults, families, and children alike! Maine has an amazing landscape with incredible outdoor activities offered year-round. In the summer we have beaches, mountains, and lakes where we can swim, hike, and kayak all summer long. In the winter months these beaches, mountains, and lakes are covered with snow and ice allowing us to explore the beauty of Maine in a different (and colder) light. During high school and college I worked at a local ski mountain teaching young kids how to ski and then I moved up to ski patrol when I needed a break from herding the little rascals around the mountain (and picking them up when they fall down). I don’t do much alpine skiing anymore, but I have put my mother’s old cross-country skis to good use in my new favorite winter sport – cross-country skiing! There are many places around Maine where you can go cross-country skiing. Some places are free and some you have to pay a small fee to use the trails. I’ve aggregated a list of various places to cross-country ski in the southern Maine region ranging from Dayton all the way up to Bethel. I’ve skied at most places myself and a few I have not yet but plan on skiing in the next few weeks. Bethel Nordic Ski Center is located in the center of the classic small Maine town of Bethel. The trails wind through open fields (i.e. the golf course) and the nearby forest for a total of 30 kilometers of well-groomed trails. Trails are groomed and tracked for both skate and classic skis. Conditions can be checked daily on their website. A full day pass will set you back $20, but their afternoon pass only costs $16. Rentals are available for both classic ($20) and skate ($22) packages. If you head over after 1pm you’ll save a few dollars. Make a weekend of skiing and stay at the beautiful Bethel Inn just a few steps from the trails. Location: 21 Broad Street, Bethel. $20/$16 Adult; $16/$13 Student/Senior. Rentals range from $20-$22. Open 9-4:30 daily. Carter’s has two locations in the western Maine area. One is located off of Route 26 in Oxford and the second is located a few miles from Sunday River in Bethel. The Oxford location has over 40 kilometers of groomed trails that range in difficulty from beginners to the immediate skier. The Bethel location is slightly larger with over 55 kilometers of trails for the beginner to the advanced skier. Most trails are wide with two-way traffic for both classic and skate skiers. Depending on the day, you might be able to ski with your dog too (just call ahead first to see)! Both locations offer rentals in case you don’t have your own gear or you’re looking to upgrade to the latest and greatest skis at their ski shop. An adult day pass is $15 with discounted tickets for students, seniors, and children. Rentals only cost about $15 a day. If you ski a lot at either location then the $99 individual ski pass is an awesome deal! The trails are open daily at Bethel from 9a to 4p and at the Oxford location from 10a to 5p. For the latest trail conditions head over to SnoCountry. Location: 420 Main St (Route 26), Oxford and 786 Intervale Rd, Bethel. $15 Adult; $10 Students/Seniors; Free Under 6. $15 rentals. Open Daily 9a to 4p (Bethel) and 10a to 5p (Oxford). Pineland Farms is home to over 5000 acres of fields and woods for various outdoor activities. During the winter months, the trails are open to the public for skiing, sledding, and snowshoeing. Pineland has over 30 kilometers of professionally groomed trails open to both classic and skate skiers. Trails are one-way with the exception of a few connector trails. The trails are tracked for classic skiing, which takes a little time to get used to, but really awesome. Pineland is mecca for skate skiers and on a nice winter weekend you’ll see them out in droves. The trails are well-marked with maps scattered about in case you get lost (but make sure you grab a free paper one before leaving the warm lodge) and the difficulty of the trails range from beginner to advanced. One of my favorite trails is the Campus Loop. Pineland has a well stocked rental shop with rental packages ranging from $16 (classic) to $24 (skate). You’ll get a few dollars discount if you go after 1pm (they start selling tickets around 12:45p). Lessons are also available by appointment. Day passes for adults are $13 a day and $9 after 1p. The best part about Pineland is their awesome cafe located just above the rental and ticket location. After a morning of skiing you can grab a cup of hot homemade soup and hot chocolate! Location: 15 Farm View Drive, New Gloucester. $13/$9 Adult; $9/$6 Student/Senior; Free Under 6. Rentals range from $16-$24 (cheaper in the afternoon and for children). Lessons available by appointment. Open 9a to 5pm daily. Located in York County, Harris Farm is home to over 40 kilometers of trails through pastures and woods. Trails range from fairly flat beginner-friendly trails to more advanced trails with rolling hills. About 30 km of the trails are groomed for skate skiing while over 35 km are tracked for classic skiing. Dogs are allowed on trails Monday through Friday! Adult tickets cost $12 during the week and $15 on weekends. There are discounted tickets for both students and seniors. Rental packages range from $15 for a classic adult package ($10 for kids) to $22 for a skate ski package. Lessons are very reasonable ($30/hour private or $18/hour group) and can be made by appointment. Trails are open 9a to dusk daily. Ski conditions are updated daily on their website with any upcoming events list such as ski clinics. Location: 280 Buzzell Road, Dayton. $15/$12 Adults; $10/$8 Students/Seniors. Rentals range from $15-$22. Open daily from 9a to dusk. Five Fields Farm is located in the picturesque town of Bridgton (also home to Shawnee Peak). Trails are located about 20 minutes from the Shawnee Peak parking lot off of Route 107. During the warmer months, Five Fields Farm is an active apple orchard and during the winter months you can ski through the orchard and take in the views of the western Maine mountains! Over 25 kilometers of groomed and backcountry trails are available for beginners to advanced skiers. An adult day pass costs $12 and $10 after 2 pm. Kids are $10 a day and $8 after 2 pm. Five Fields Farm also honors the WinterKids pass so it’s perfect for your kiddos! Rentals are available for the full day or half day. Trail conditions can be found on SnoCountry daily. Location: Route 107, South Bridgton. $12/$10 Adults; $10/$8 Children. Rentals range from $12-$18. Open daily from 9a to 5p. I have fond memories of going to Smiling Hill Farm as a child to pet the animals and milk the cows. I have also ridden my horse on their trails for a fundraising event years ago. During the winter months Smiling Hill Farm grooms over 25 kilometers of trails winding through their vast pastures and woods. Trails are tracked for classic skiing and wide enough for skate skiers. Smiling Hill Farm is just a hop, skip, and a jump from Portland so it’s one of the closest trail systems to the city. A rental shop is available on site with prices ranging from $10 to $15 a day. Discounted tickets are offered after 1pm. Location: 781 County Road, Westbrook. $12/$8 Adults; $8/$6 Youth. Rentals range from $10-$15. Open daily from 9a to dusk. Bradbury Mountain State Park is a state park located off or Route 9 in Pownal. It is a popular warm weather destination but is equally as awesome in the wintertime. The park is home to miles of trails that range in difficulty of steep climbing up to the top of the mountain to nice wide trails across the street. Make sure you grab a trail map at the ticket booth as it will tell you which trails are open to skiers. 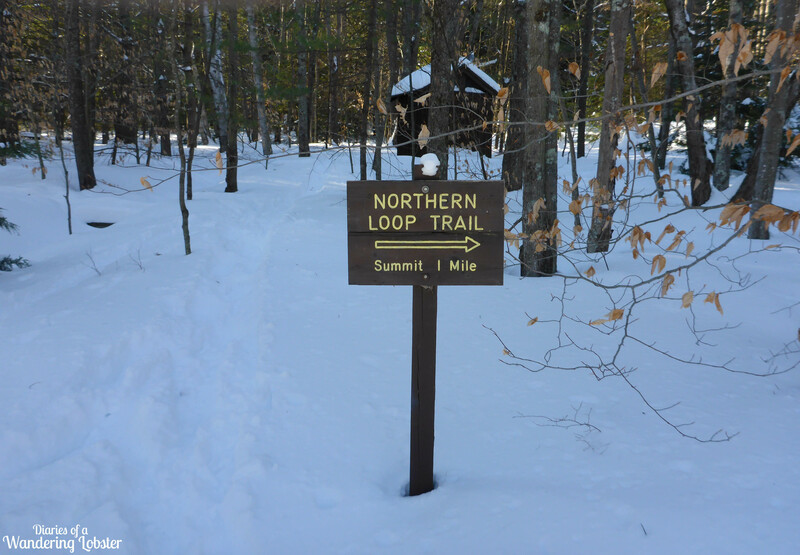 Trails open to cross-country skiers include Boundary, Northern Loop, Ski, Switchback, and Tote Road. There is no rental shop at the park thus you need your own equipment. There is a small entrance fee ($3) that should be left in the drop box at the gate. Don’t skip the fee. It helps preserve the park and keeps it open to the public to enjoy. Trail conditions can be found on the state park website, but it is not updated regularly. Trails are generally packed, but not always. So be prepared for any type of conditions. Location: 528 Hallowell Road (Route 9), Pownal. $3 Maine Adult Residents; $4.50 Adult Non-residents; $1.00 Seniors/Children. No rentals available. Open daily 9a to sunset. Sebago Lake State Park is a popular destination in the summertime for locals and tourists alike. During the winter months, most of the park shuts down and regresses to a quiet, peaceful place perfect for some cross-country skiing! The park has about 20 miles total of trails between the Casco and the Naples side. About 3.7 miles are tracked for classic and 1.5 miles are groomed for skate skiing. There are about 6 miles of ungroomed, “backcountry” trails on the Naples side. Winter trail maps are available at the gate and you can check the latest trail conditions on the state park website. There is a small entrance fee for park use. No rental shop is available so you need your own equipment. Location: 11 Park Access Road, Casco. $4.50 Adult Residents; $6.50 Adult Non-residents; $1.00 children. No rentals available. Open daily 9a to sunset. During the winter months, Riverside Golf Course is open to the public for cross-country skiing. The golf course offers miles of groomed trails on a wide rolling hill golf course. It is one of my favorite places to ski at night with a headlamp. The snack bar is open year-round so after a day of skiing you can warm up with a cup of hot chocolate. The old Riverton Trolley Park is home to several miles of additional trails that connect to the golf course. The trails wind through the woods and fields adjacent to the Presumpscot River. The City grooms about 7 kilometers of trails in the golf course, but it is often untouched for a day or two after a snowstorm (and there have been a lot of them!). The trails in the old trolley park are not groomed. There is no rental shop, but youth might be able to rent gear from the Portland Gear Hub. Location: 1158 Riverside Street, Portland. FREE! No rentals available. Open daily. Located in the heart of the Deering neighborhood, Evergreen Cemetery is the second-largest cemetery in the state at 239 acres. You might think that cross-country skiing through a cemetery is a bit odd, but the cemetery has an adjacent park with miles of wooden trails and four ponds. During the warmer months, the cemetery is commonly used by mountain bikers and trail runners. The trails also connect across the street to Baxter Woods. Trails are not maintained by the Recreation Department so be prepared for any conditions. Trail maps are located at the cemetery office from 7:30a to 3:30p weekdays. The cemetery is open for use daily from 7a to 4:30p. Location: 672 Stevens Avenue, Portland. FREE! No rentals available. Open daily from 7a to 4:30p. Libby Hill Trails is an awesome network of 8 miles of widely groomed trails open to the public daily for free! It is one of my favorite places to ski. Trails vary on difficulty as the area is rather hilly. Trails do intersect with several snowmobile trails, but I have not encountered any problems. Just keep your eyes and ears open just in case. The trails are open 24/7 during the winter months so you can easily do a night ski, just be mindful of neighboring homes. There is no rental shop at the location so you need your own gear. There is a small parking lot near the trail head with a large map. There are also several map signs out on the trails in case you get lost. A printable map can be found on their website. Dogs are allowed on the trails if they are leashed. Make sure to pick up anything they might “drop” on the trails too. Location: 50 Libby Hill Road (the high school), Gray. FREE! No rentals available. Open daily. Starks Hill is located near the New Hampshire border in the little town of Fryeburg. Trails are situated on the side of 1000+ foot hill and has been home to the Fryeburg Academy ski team since the 1940s. Trails are groomed and maintained by Weston’s Farm. While the trails are technically free, they ask that you pay a $5 suggested donation to cover the costs of grooming, maintenance, and improvements. Do it! The local ski teams use the trails after 3p during the week so it is recommended that you use the trails before then. Also check the race schedule on the website because Starks Hill often hosts races on the weekend too. Dogs are not allowed on the trails and use the large parking lot before the oil tanks on the left-hand side of the road. Location: Oxford Street, Fryeburg. $5 suggested donation. No rentals available. Open daily but recommended to ski before 3p. Twin Brooks Recreation Area is home to about 10 kilometers of running (summer) and cross-country ski trails that are tracked and groomed for public use. The trails were designed by Olympic Biathlete John Morton. The trails are maintained by the town of Cumberland and while trail usage is free, there is a donation box at the trailhead to help cover the costs of grooming and maintaining the trails. There are trails on both the Greely Road side and the Tuttle Road side. Dogs are not allowed on the Tuttle Road trails and there is no place for rentals. Location: 185 Tuttle Road, Cumberland. FREE! No rentals available. Open daily 6a to 6p. Cross-country skiing, whether classic or skate, is an excellent form of cardiovascular exercise during the long winter months. Make sure you drink plenty of water and wear layers. This winter has been bitterly cold, but you’ll warm up quickly while moving. Know the signs for frostbite and hypothermia. Always let someone know where you’re going and when to expect you home. So instead of hiding inside by the fire all winter long (although that sounds amazing as well! 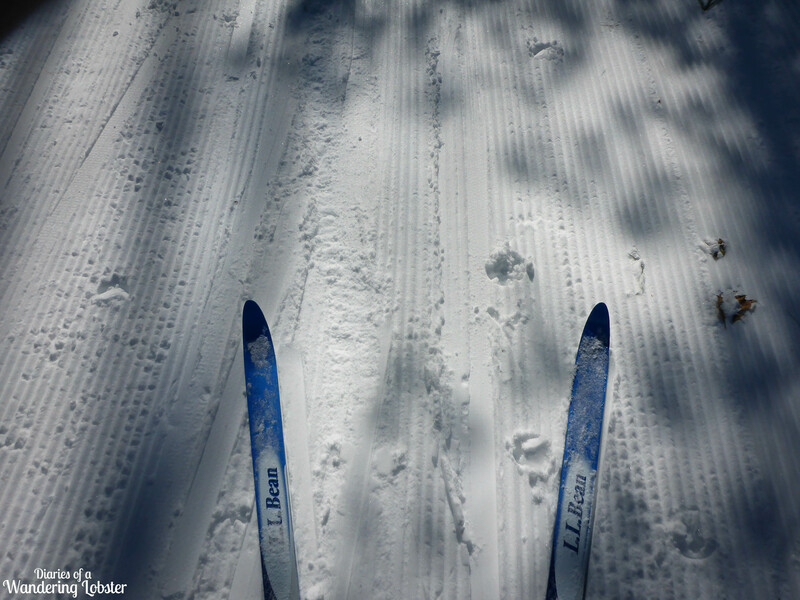 ), grab your skis and hit the many trails available through the state of Maine! Happy skiing! Do you cross-country ski? Where is your favorite place to ski in Maine?